Today we’re happy to bring you an interview with LanguageCorps alum Taylor Crowley. Taylor spent about seven months teaching English in Florence following the LanguageCorps TEFL Certification Program. We thought that her story would be interesting for those of you that are also considering teaching English abroad, whether in Italy or elsewhere! Taylor is one of many LC graduates who transitioned from teaching abroad to a teaching position in the US. It’s always great to hear from participants that have found their experience teaching abroad useful in further developing their long term career goals. We’ll be posting more alumni interviews throughout the fall, so keep checking back for more stories from current and former LanguageCorps teachers around the globe! I currently live in Park Ridge, Illinois- a suburb of Chicago. Upon returning to the US, I had to find a job fast. I flew back on August 10th, 2012, and the schools were going back around the 21st. I applied to just about every district and was quickly hired by a district in Skokie, IL as a first grade instructional assistant. I was teaching reading to first and fourth graders, as well as helping out in a first grade classroom. In February of this year, I was hired for a new job in the same district. A teacher at another school decided to take the rest of the year off for a maternity leave. I switched schools and am now a full time first grade teacher. I was up late one night, clicking through Stumbleupon. The LC website popped up and I was on the “apply” page in about 3.7 seconds. I worked in Florence, Italy, where I also took the TEFL Certification course. Boredom and fear…. I was bored with the everyday grind and looking for some excitement. I was too wrapped up in college life to study abroad or travel. Traveling without an income is extremely difficult, so working abroad was my answer! Fear came when I realized that I was about to fall into the “real world trap” of finding a full time job before being able to experience my youth and see the world. 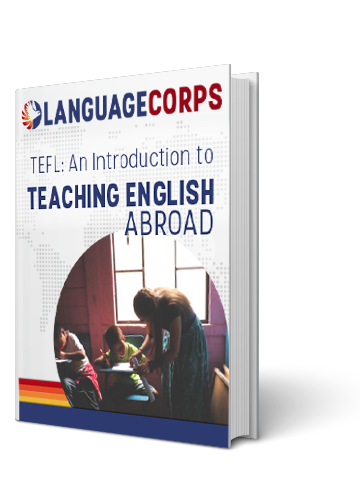 What was the most exciting thing about teaching English abroad? The most exciting thing was finding a job at a school that I absolutely loved. I was fortunate enough to have adults as students, who quickly became my friends. The school had a relaxed and comfortable vibe and it was amazing to see the students progress during the time I was there. Seeing improvements like that is one of the best feelings for a teacher! There were a few minor challenges that just took some getting used to. Converting money, ordering food in another language, public transportation, not having easy access to a washer and dryer, and learning to stretch one paycheck over a whole month were just a few. Anything that was different from my life in the states took some time to adjust. However, I learned that you can pretty much always adjust. I started looking at euro prices and automatically converting to dollars in my head. My Italian got much better and I was able to order just fine. I learned the whole public transportation system in Florence and was able to make it just about anywhere I needed to go. My arms got stronger from hauling my laundry around town to the nearest Laundromat. I learned to budget and sometimes eat spaghetti every night for a week 🙂 Like I said, anything different from my life in the states took me time to get used to. Let’s face it- we all have our routines and we all find comfort in stability. The exciting part is shaking things up and learning that you can change some things in your lifestyle! Too many to list! Something I loved about Florence was all of the festivals. My favorite happened within the first month I was there. The incredible Chocolate festival! Any kind of chocolate, mixed with anything you could think of, piled on all foods imaginable…. Being a chocolate lover myself, I was in heaven. People watching in the piazzas became part of my daily routine and pasta and wine were staples in my kitchen. Exploring different restaurants was easy to do with so many choices. Hiking up to Piazzale Michelangelo with a bottle of wine to watch the sunset was a weekly event for me and friends. That is my favorite spot I have ever been in my entire 23 years of existence. I can’t wait to go back! Had you ever done anything like this in the past (examples: Peace Corps, Teach for America, etc)? I traveled to Italy in high school for a school trip and fell in love. I knew I had to go back one day. Our trip was only about 9 days and I needed more! What would you recommend people interested in teaching abroad consider beforehand? The most important thing is to go at the right time. I was lucky enough to find a time when I had nothing holding me back. No job to come home to, boyfriend, husband, kids, or anything else that could potentially give me a deadline. I went with every intention of staying as long as I could afford my rent. I had no obligations and it made my experience much more pleasurable. Seven months went by in the blink of an eye.